What do I mean by 3rd Testimony in Adhaan and Iqaamah? I am talking about the saying, "أشهد أن علي ولي الله" or any other variation that is said about Imaam 'Alee (AS) during the adhaan. The first thing I would like to mention is that the issue of the 3rd testimony in the Adhaan/Iqaamah was condemned by ALL major scholars before Al-Majlisi's father (Muhammad Taqee Al-Majlsi) who died in the year 1080 AH (See: Al-Majlisi I, RawDah Al-Muttaqoon). Al-Majlisi backed up his father and said that doing this 3rd testimony in the adhaan / iqaamah is a great act. So for 1000 years, this issue was either condemned, called a bid'ah, calling the people who do this action a form of ghullah (exaggerator), or simply hasn't even been mentioned in their books(for it wasn't important). There are 0 (zero) SaHeeH hadeeth from Shee'ah books that says that it is permissible to add the 3rd testimony in Adhaan or Iqaamah. Or ANY hadeeth that says that it is mustahab (recommended), or anything that says "do it with the intention of it NOT being part of the adhaan/iqaamah". None. Zero. Nada. I would like to narrate a muwaththaq (reliable) hadeeth directly from Imaam Muhammad Al-Baaqir (AS) where he talks about how many parts / phrases are in the Adhaan. He (AS) said: The Adhaan and the Iqaamah have 35 characters/parts, just check it by his hand one by one, the adhaan has 18 characters/parts and the Iqaamah has 17 characters/parts." Now if you were to add the 3rd testimony in the Adhaan & Iqaamah, the Adhaan would consist of 20 part and the Iqaamah would consist of19 parts. These two combined would make it 39 parts, and as you can see the Imaam (AS) never said anything about that. Let us look to the major scholars of Shee'ah Islaam pre-Majlisis. 1.) Here is what Al-Sadooq (d. 381 AH) has said concerning the 3rd testimony. Here are his actual words. Translation: "This is the Authentic / Correct (SaHeeH) adhaan; nothing is to be added or subtracted from it. The mufawwidah's (form of ghullah), may Allaah curse them, have fabricated traditions and have added to the adhaan مُحَمَّدٌ وَ آلُ مُحَمَّدٍ خَيْرُ الْبَرِيَّةِ (Muhammad and the family of Muhammad are the best of mankind) twice. In some of their traditions, after saying أَشْهَدُ أَنَّ مُحَمَّداً رَسُولُ اللَّهِ (I bear witness that Muhammad is the Prophet of Allaah) (they add) أَشْهَدُ أَنَّ عَلِيّاً وَلِيُّ اللَّهِ (I bear witness that 'Alee is the Walee of Allaah) twice. Among them there are others who narrate this أَشْهَدُ أَنَّ عَلِيّاً أَمِيرُ الْمُؤْمِنِينَ (I bear witness that 'Alee is the commander of the faithfull) twice. There is NO doubt that 'Alee is the walee of God and that he is the true commander of the faithful and that Muhammad and his family, peace be upon them, are the best of creatures. However, that is not [part] of the original adhaan. I have mentioned this so that those who have been accused of concocting tafweed and have insulated themselves in our ranks should be known." Translation: "And the Adhaan & Iqaamah has 35 parts, the Adhaan has 18 parts and the Iqaamah has 17 parts"
3a.) Here is what Al-Toosi (d. 460 AH) had to say about the 3rd testimony in the adhaan. Translation: "The are some odd (shaadh) reports of saying أشهد انّ عليا وليّ اللّه and آل محمّد خير البريّة. You must NOT do it in the Adhaan and Iqaamah. And whoever does this action is in mukhTi (error)"
3b.) Here is another quote from Al-Toosi regarding the 3rd testimony in Adhaan. Translation: The adhaan has 18 parts: Takbeer 4 times, Witnessing to Tawheed, (Witnessing) to the Prophethood, Hayya 'Ala Salaah, Hayyah 'Ala FlaaH, Hayyah 'Ala Khayrul 'Amal, Takbeer all of these have to be done twice. Translation: "And anything that is added to this (adhaan & iqaamah) is a bid'ah"
Translation: "And it is NOT permissible to say إن عليا ولي اللَّه and آل محمد خير البرية since there is no ruling for it in the sharee'ah"
6.) Here is what Shaheed Al-Awwal (d. 786 AH) has said about the 3rd testimony in Adhaan. Translation: "It is NOT permissible to believe in the legitimacy of Witnessing the Wilaayah of 'Alee and "Muhammad wa Aalih Khayrul Bariyyah" in the adhaan and iqaamah, even though these events are factual! 7a.) Here is what Shaheed Al-Thaanee (d. 966 AH) has said about 3rd testimony in Adhaan. Translation: It is NOT permissible to believe in legitimacy of other parts in adhaan and iqaamah, like witnessing to wilaayah of 'Alee and "muhammad wa aalihi khayrul bariyyah". 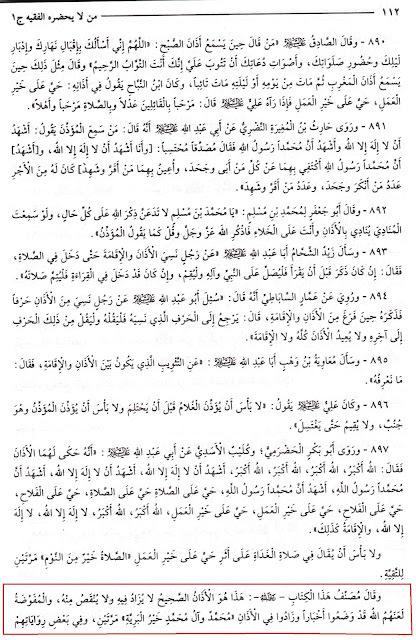 As not EVERY factual reality can be inserted into the legally prescribed rituals ('ibaadaat), specified by the Allaah (SWT), since inserting theses things will be regarded as bi'dah and legislation, similar to addition of a rak'ah or tashahhud or alike things to the acts of worship ('ibaadaat)"
Translation: "And addition (to the adhaan & iqaamah) of عليّاً وليّ اللّه and آل محمّد خير البريّة is a bid'ah and the narrations regarding it (3rd testimony) is mawDoo' (fabricated)." Rough Translation: Since the shee'ahs condemn the 2nd ('Umar) for adding to the Adhaan that wasn't during the time of the Prophet, it is improper for them to emulate such an act (by adding the 3rd testimony). 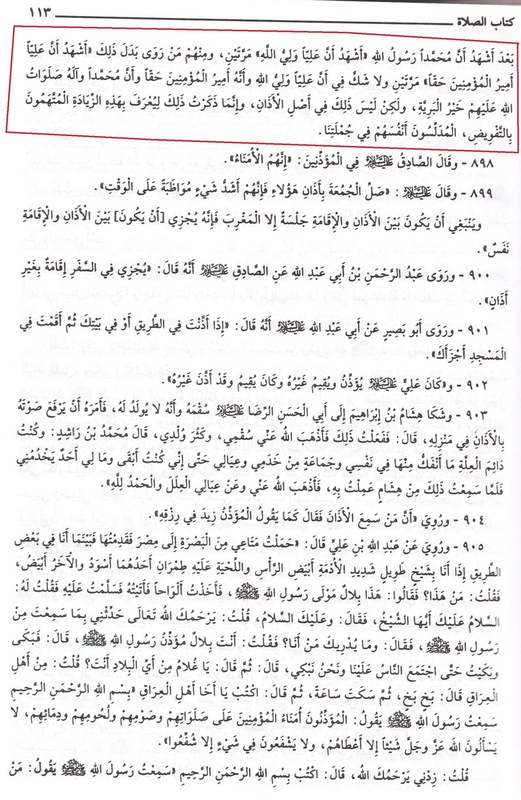 Now, look at what a during the time of Al-Majlisi, after he said it is okay to put it in the Adhaan. 9.) Here is what Al-Muhaqqiq Al-Sabzawaaree (d. 1090 AH) had to say about the 3rd testimony in Adhaan. Translation: "And about adding the أنّ عليّا وليّ اللَّه and آل محمّد خير البريّة , the jurists have clearly stated that this is a bid'ah. And the statement is true. But adding it to the adhaan is dependent upon its divine ordainment. (al-tawqeef al-shar'ee)"
As you can see, our major scholars that came before the Al-Majlisis condemned this action. Even Al-Khomeinee talks about the aHaadeeth that allude to the 3rd testimony in Adhaan and Iqaamah. "In some Da'eef (untrustworthy / weak) narratives it is stated that after testifying to the Messengership in the adhan one is to say: "I testify that 'Ali is waliyullah (Allah's friend)" twice. In other narratives, one is to say: "I testify that 'Ali is truly Amirul Mu'minin" twice. In some others, one is to say: "Muhammad and his progeny are the best of people". Ash-Shaykh as-Saduq(may Allah have mercy upon him) took these narratives to be invented and he denied them. It is well known among the 'ulama' (may Allah be pleased with them) that these narratives are not reliable." testimony in Adhaan. Here is the hadeeth. Translation: I said to Aboo 'Abd Allaah (6th Imaam), that they (sunnees) trasmit a tradtion in their [books about] mi'raaj, that when the Prophet (SAWAS) was taken on the night of ascension he saw writing on the throne which read, "There is no God, but Allaah, Muhammad is the Prophet of God and Aboo Bakr is the truthful one." Imaam Al-Saadiq (AS) said: "SubHaanallaah (Glory be to Allaah), they have changed EVERYTHING including this?" Al-Qaasim said: "Yes", Imaam Saadiq (AS) said: "When Allaah (SWT), created the throne he wrote on it: "There is no god, but Allaah and Muhammad is the Prophet of Allaah and 'Alee is Ameer Al-Mu-mineen......the tradtion goes on until Imaam Saadiq (AS) at the end says this..."Whenever one of you recites the Shahadatayn, say 'Alee is Ameer Al-Mu'mineen." 1. This hadeeth is not found in any other book before Al-Tabarasee narrates it in his book (Al-Ihtijaaj). It is very unlikely that a person just appears and narrates a lengthy hadeeth like this and then disappears. Since this hadeeth is talking against the Sunnees and Aboo Bakr, it would seem that the companion had to be VERY close to the Imaam (AS), that he would trust him. Usually our Imaams (AS) would do taqiyyah (dissimulation), and only narrate such hadeeth with their close companions. One thing to note, this hadeeth has NOTHING to do with Adhaan and Iqaamah. In order to "add" things into you 'ibaadah, you must have tawqeef (divine ordainment), meaning there has to be a SaHeeH hadeeth from the Prophet (SAWAS) or the Imaams (AS) that allow this. In conclusion, doing the 3rd testimony in the adhaan / iqaamah is reprehensible bid'ah (innovation), that must be stopped immediately. Doesn't matter what "intention" you say it. A bid'ah is a bid'ah. It is bidahtul Hassanah- as Umar (ra) reported to have said about tarawiah. Yes i think this still here more to "different" from the majority i believe rather than deen unfortunately. Baqir Majlisi further corrupted the shia. Baqir Majlisi says "There is nothing left between us and the Arabs but slaughter"
but yes adhan doesn't include the third shahadah and it is indeed a bid'a and we have sahih hadiths confirming the right adhan without it. I was wondering that you have posted some very strong ahdith going against the inclusion of the third testimony, so what would you have to say about marja's like ayt. sistani and ayt. khamenie allowing it? if you have asked them on this matter, i would be grateful if you shared it here. Apart from that it would also be great if you could state how you have determined these ahdith to be strong or weak. I, myself, haven't determined if these aHaadeeth are authentic or weak, but `Allaamah Al-Majlisi, compiler of Bihaar Al-Anwaar have stated that the hadeeth is authentic, not me. welcome to the blog, I hope you enjoy reading the various articles! The only source that mentions 3rd testimony in tashahhud is from the book called Fiqh Al-RiDaa (sometimes called Fiqh Al-RaDawee), which is considered to be a fabrication upon the name of Imaam Al-RiDaa (AS). Some people say that it was the book of Al-Sadooq's father, but when you look at Rijaal books you never see any mention of this book under the books that he authored. It seems as if the first time this book appeared is during the Safawid dynasty. Al-Majlisi doesnt' give the tareeq (path) on how he has received this book, which previous scholars. So for us to analyze that is impossible. Also, in this book in the wuDoo portion it is said for the person to "wash" his feet. Which is of course against the very beliefs of the shee`ah, we are suppose to "wipe" as the Qur'aan has ordered us to. So since the only shee`ah hadeeth that talks about 3rd testimony stems from a book that is either considered a fabrication or not authentic, then this is automatically considered weak. قال امام صادق علیه السلام : اذا قال احدكم لا اله الا الله محمد رسول الله فلیقل علی امیر المومنین ولی الله. Imam Jafar Sadiq (as) says: “When any one from you says ‘La ilaha illa Allah, Muhammadan Rasool Allah” then he must say ‘Alian Wali Allah’. and there also included a NOTE ON THE AUTHENTICITY OF ""Fiqh Ar Raza ""
Bro i am a student and beleive that 3rd testimony is Bidah but when i find these traditions so it create confusions ... why our some ULEMAS are so ignorant ..!! This narration is hujjah on us and there are so many other narrations which talk about how the whole of the prophets bore witness to 3rd shahadat and how Ali (as) is the essence of adhaan and salah itself. The problem with Mr. Zaveri and his likes is that they love to weaken everything in the light of Ilm e rijaal. But on the contrary to these narrations, the opponents of 3rd testimony cannot bring any other narrations which condemn those who recite 3rd shahadat. Brother Adeel, I have already taken out this tradition that the people quote from iHtijaaj, and I talked about the weakness. I wouldn't say our `ulemaa are ignorant, they know of the opinions of our classical scholars. I am happy that I came across this blog concering the 3rd kalimah in the adhan because I have been wondering about it since I became aware that there were different opinions about it. Now, I intend to believe that it is a bid'ah too. I usaully hear brother's justification on this and why the scholars allow this is because for about 90 years, the Ummayads use to curse Ali's name in their khutbahs. But when you reflect on this, non of the Imams has authorized this. The statement is true, concerning Ali's status, but it should not be use to replace the Sunnah of Allah and His Prophet for Allah says"....wa lan tadila li-sunnatillahi tabdeel." "... and never shalt thou find in the sunnah of Allah any change" 33:62. I pray to Allah to keep me on the straight path. That is great brother. Check out other blog posts brother. I talk about other bid`ah and many other sunan acts that have been lost. You are indirectly calling Al Majlisi a Person who allows a Bida, yet you are taking his gradings about Ahadith all over your website. What makes you so sure he didnt do Bida in this too? Isnt that some sort of hypocracy in your humble opinion? No, this is not hypocritical. I am merely giving the gradings of his hadeeth. 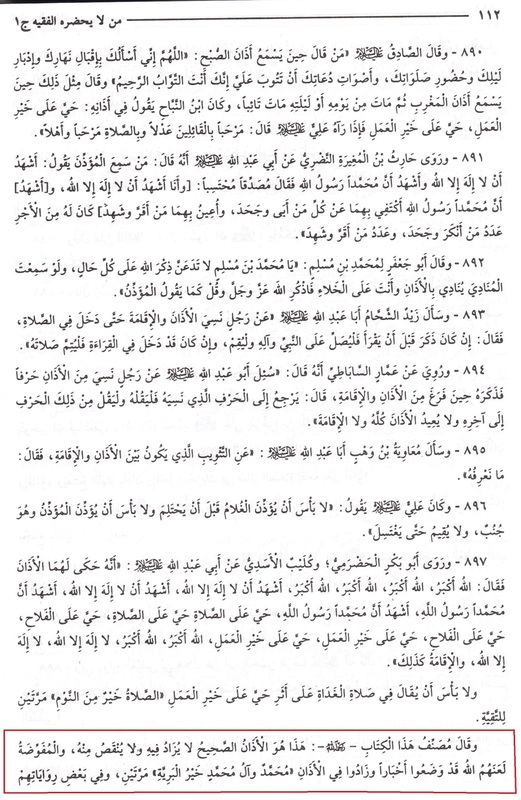 Every single hadeeth that al-Majlisi grades, I have double checked the gradings myself. I just put al-Majlisi's grading, so people can see a scholars grading, and not just me saying such and such is SaHeeH. Our Maraje keraam are far more learned and deeply delved in knowledge and experience than you or anyone else who writes such blogs. It is impossible to even consider for a moment that our Ulamae keraam would allow an innovation to continue. Hence it becomes incumbent upon you to go and ask them reasons behind their fatawa. This should be the only approach if your intention is not to divide muslim ummah. Our current marjeh are more literate then you and possess more knowledge than you. They have attained education for decades and than obtained the right of calling themselves a marjeh. They are well aware than of you of all the practices followed by Shia Muslims around the globe as a lot of shia scholars from different countries visit them daily. You by just conducting small research and just for few days, does not possess the right of writing blogs that can create divided opinions and tensions among shia muslims. If it would have been a bidat our current marjeh would have already issued a fatwa asking shia muslims to refrain themselves for this act. And, if you really think you are right of what you said, get us a fatwa attested by any of the current marjeh. Translated by Tahir Ridha Jaffer. This might help brother Nader. From the dua of the Prophet(s) when "Adhan" was finished, the Noble Prophet(s.a.w.a. )called it a "perfect call" so no more no less. Hurry to the prayer. Hurry to success. Hurry to the best of actions,he said: There is no power and no might but by (the will of) Allah. Funny how the writer didnt state whether the hadith is authentic or not from sources he doesnt like. Thats an insult to the Imams!